This publicly editable “wiki” post exists to document and track the basic use-cases (presets) for delta chat, together with corresponding customization settings, and contact or message specific customization rules. The (missing and implemented) rules and configuration options needed to configure deltachat properly for these use-cases are listed and explained in more detail further down. The user needs to manually follow and read through the “contact requests” (maybe better called “Incoming E-Mail” or just “E-Mails”?) to see and catch chat attempts by unknown contacts… For known contacts, incoming new chats are not opened before confirming an “Open Chat?” prompt, but afterwards all following messages from that contact are considered chat messages (bad). It should be enough to only download the message list without body and attachments. After starting a chat with a known contact, all email messages from that contact, even classic ones, only open in deltachat. Introduce email message metrics, to detect which classic emails that are not chat-resposes should start or prompt to start a chat, and to improve the differentiation when displaying emails in chats. See config option 4) below. Make classification errors absolutely non-critical, see “tentative chats” and “Function to re-assign selected messages” under general features below. Incoming chat messages are signaled twice, not only by deltachat but also by classic email clients like K9 etc. During the initial configuration deltachat MAY ask which of three “Chat Approval Modes” (working title) should be used (also see https://github.com/deltachat/deltachat-core/wiki/IMAP-strategy#setup-first-start-after-installation for more IMAP specific details.). But we could just use the most common-ground preset as default, and allow to revise and modify the chat approval mode in the advanced options. The best default preset for new installations is to “only listen for known contacts” (it provides spam protection, least hassle to set up contacts, and backwardds compatible short email message chatting works seemlessly out-of-the-box with known contacts). It enables to automatically start a chat for all received chat-messages, and to prompt when receiving email messages that are in between a short chat and a classic longer email message. Disables option 2.1) Prompt/open tentative chat for all email-chat compliant messages. Disables the scanning of messages on IMAP server for newly approved email receivers (MsgSCAN). setting option 4) max. chat message length to zero, to disable prompting for any classic email message. or enable option 2.1) Prompt/open tentative chat for all email-chat compliant messages, to not have to manually browse for new chat compliant messages from unknown contacts in the New (incoming) Emails (feasible with low-spam email accounts). Enables option 2.0) “open chat for all messages”. Also allows creating sender specific blacklisting rules. When switching to another listening preset, all optional and not mentioned options above may be left as they are. disables option 5) “Account read by multiple users” Notify and show message as new, even if message was already seen elsewhere. Keep this enabled (default) when account is shared with other users, or a POP client (MUA), that may change the status to “seen”. This allows a devices to notify the user about new messages, even if another email client already set the status to “seen”. [ ] 1) Show number of Incoming (new) Emails in chat list (formerly contact requests) on in the chat list screen by default (instead of only in the menu). [ ] 4) Have a max. chat message metrics configuration option (not counting attachments, default to 240 chars, 3 linefeeds? ), see here and Classic email listening: "start-chat" metrics for classic email client messages (max. length & newlines). Use MR_MAX_GET_TEXT_LEN for this as well? Do not open new chats for longer messages. In already existing chats, show longer emails only silently as an envelope icon, clickable to display the received (longer) email. and only auto-move shorter email messages into the chats folder, after they were accepted for a chat, to allow answering all regular short emails with classic MUAs and avoid leaving NON-In-reply-to chat messages (MUA initiated chat messages) in the INBOX. => In conjuction with the general “re-assign” feature below, this allows separated handling of slower paced, elaborated E-Mail exchanges in MUAs, without prompting or disturbing chats – while allowing chats to be aware of, and able to refer to, parallel emails. [ ] 5) Single-user multi-device Account read by multiple users: Notify and show message as new, even if message was already seen elsewhere (not just new AND unread messages). Default: true (Avoids unreliable notifications for users that still have some parallel POP client configured.) With AltMarkMove (“seen” only if moved/disappeared from INBOX https://github.com/deltachat/deltachat-core/wiki/IMAP-strategy), a disabled setting must not be effective (greyed out then). on the server: move it into INBOX with not-seen status and Chat-Version: false to delegate it to classic MUA. Also remove “mr.thread” from References? 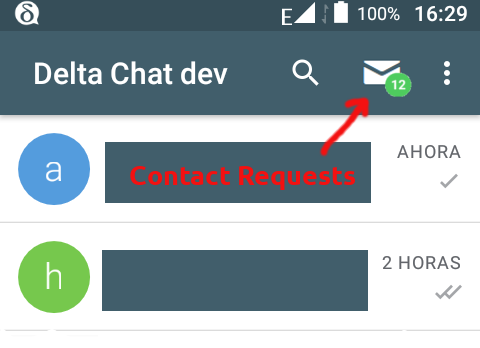 let user select the chat to re-assign the message to https://github.com/deltachat/deltachat-android/issues/324). The user should be asked to select the rules upon answering or moving/deleting the first message from a new contact (selection depends on type of reaction, see general features below), and the rules are saved to determine further thread handling. [ ] Allow known contacts to send a message beginning with an “ALERT” or “ALARM” subject (case insensitive) to override general muting (but not the per contact and whole system muting?). To allow paging for really important messages but being able to block. [ ] Allow the sender to suppress paging the receiver for sending low priority, silent (status) messages. Any idea for an intuitive method here, anyone? Maybe using braces “(Chat:)” or a subject not beginning with “Chat:” from a known chat contact sent with a chat program? “Silent Chat:”, “Whisper:”, “Silent E-Note:” ? Are unaccepted chats downloaded anyway? Let's switch to a new messenger? @Admins: Please turn above post into a wiki page. Thanks! How can I see it is a wiki page now? I can’t add the feature proposal category to the existing [wiki] threads (get’s lost after editing the top post). Can maybe someone give it a try to fix this please. is this a post you just want to treat as a wiki, or this is supposed to be a real wiki??? Yes, this “wiki mode” is strange here. When the admins enable the wiki mode, the top post should become editable not only by the original author. At least I see an “edit” button instead of a pencil. The devs closed the old wiki saying this forum feature that allows to make some posts publicly editable is the new wiki. Editing seems also to be available through the changelog view (button at the top right of the post). Any other ideas for a simplified wording for the basic “Chat Approval Mode” selection? The default for new installations could be the second option, together with opening received chat messages automatically and to prompt when receiving short email messages. If desired or needed, the 4 missing configuration options + 3 general features (from above, and used by these three presets) should still allow to further customize deltachat to (almost?) any use-case (advanced options).